First up, this book is not depressing, and is fun to read. I realize that’s a weird thing to say about a torture chronicle written by a current Guantanamo detainee, but I lead with it because I bought it only from a sense of duty to know, as an American, what my government is doing. I cracked the spine with dread, and then was amazed to find myself uplifted, not by the crimes and injustices of the American government, of course, but by the ability of the author to remain human and humane in the telling of his ordeal. 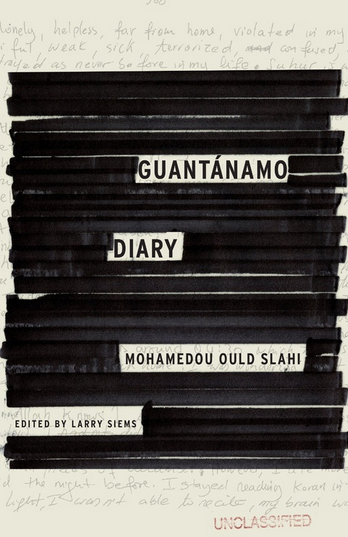 Guantanamo Diary is a page-turner and a classic of war literature and I beg everyone who reads my blog to buy it and, ideally, go sign the ACLU petition for Slahi’s release. He has the qualities I value most in a writer: a moving sense of beauty and a sharp sense of irony. He has a fantastic sense of humor. He manages all of this in English, his fourth language, a language he was in the process of learning even as he wrote the manuscript. If there’s anything good at all in a war, it’s that it brings the best and the worst out of people: some people try to use the lawlessness to hurt others, and some try to reduce the suffering to the minimum. Over time, he says, “those responsible for GTMO broke all the principles upon which the U.S. was built and compromised every great principal such as Ben Franklin’s ‘They that give up essential liberty to obtain a little temporary safety deserve neither liberty nor safety. '” The abuses he writes about are chilling, from being forced to drink 22 ounces of water every hour for weeks at a time, sleep deprivation, beatings, stress positions, forced ingestion of seawater, isolation, enduring extreme cold, ice-torture, sexual assault and much more. One of the most surprising to me was that female interrogators seem to be routinely used to sexually harass, molest and humiliate the devout Muslim prisoners. What a great use of women in the military! The people responsible for coming up with these tortures shame and degrade American service-people. Slahi eventually cracks under torture and confesses to anything and everything. It’s probably stating the obvious to say that I don’t believe honorable people treat other human beings like this, whatever the ends may be. I have only written what I experienced, what I saw, and what I learned first-hand. I have tried not to exaggerate, nor to understate. I have tried to be as fair as possible, to the U.S. government, to my brothers, and to myself. I don’t expect people who don’t know me to believe me, but I expect them, at least, to give me the benefit of the doubt. And if Americans are willing to stand for what they believe in, I also expect public opinion to compel the U.S. government to open a torture and war crimes investigation. I am more than confident that I can prove every single thing I have written in this book if I am ever given an opportunity to call witnesses in a proper judicial procedure…. Please everyone, buy the book and sign the petition. It is the least we can do. Did he say more in the book (or did you read anywhere) how he was able to write his story? (Like, did the guards give him paper and pencil, and, if they did, were they reading his stuff?) Of course, I’m always picturing being held captive much like I see in James Bond movies, so I’m curious. It’s a fascinating story, so thanks for reviewing the book! After he gave up and confessed to everything his treatment became much better at GTMO. I’ve read that he lives in some comfort now and has a little garden, so possibly it was not so difficult to get the pen and paper. The wild thing to me is that the government, which was not constrained from abducting and torturing people, was somehow constrained from destroying the manuscript. I feel you are unlikely to ever be held captive! Let’s hope. I recently heard on NPR about a photojournalist named Lynsey Addario who was held captive. She just came out with a book about it this year (It’s What I Do). She described some torture on the NPR show, but also described some kindness, depending on the guards. The whole concept of capture/torture is just bizarre to me. Reblogged this on mild und leise.